Spiders represent a a major portion of Michigan's invertebrate diversity. While most Michigan spiders can be found in both upper and lower peninsulas, the Northern area is especially prone to them. Rich, natural habitats, as well as the lack of urbanization that characterizes regions south make chance encounters with certain species more likely. Both residents and visitors will benefit from familiarizing themselves with those types of spiders. Orb weavers, also known as garden spiders, are from the family Epeiridae. They represent one of the most beautiful state spiders, and are known for weaving spectacular webs of concentric circles. The species' size varies, and these grow up to 2 inches including the legs. Females are usually even larger. Orb weavers are identified by their plump, golf ball-like abdomens. 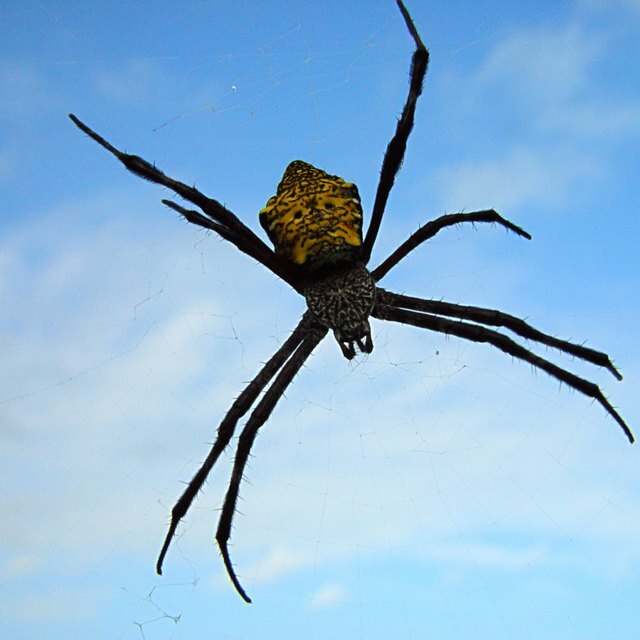 Those from the genus Argiope have a brilliant black and yellow coloring, and are most often spotted hanging upside down in the center of their webs. They wait for vibrations caused by prey, which wanders into their trap. 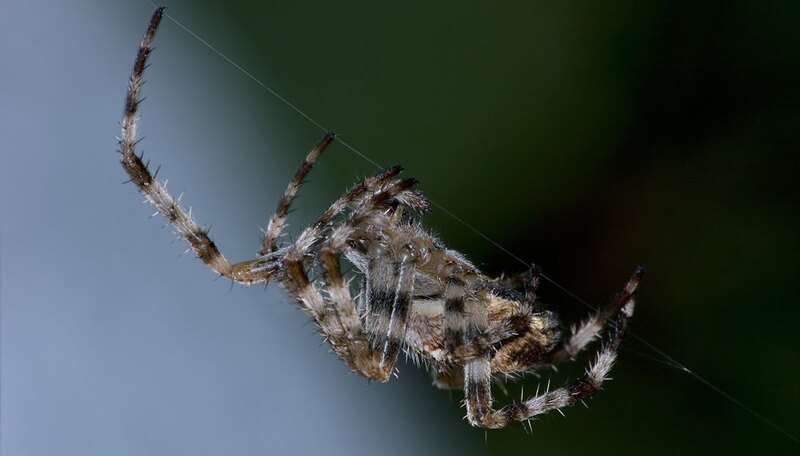 Look for Orb Weaver webs in the morning, when dew is present, or under roof eves near outdoor lights. They are also found in gardens or crop fields, where they serve as natural pest control. Wolf spiders are members of the large Lycosidae family and are fairly common throughout Michigan. While some species are small, most are large, ranging from 1/10 to 1-inch long, and females are among the larger. Their brown, orange, black, and gray coloring camouflages them with surroundings, whether indoors or out. 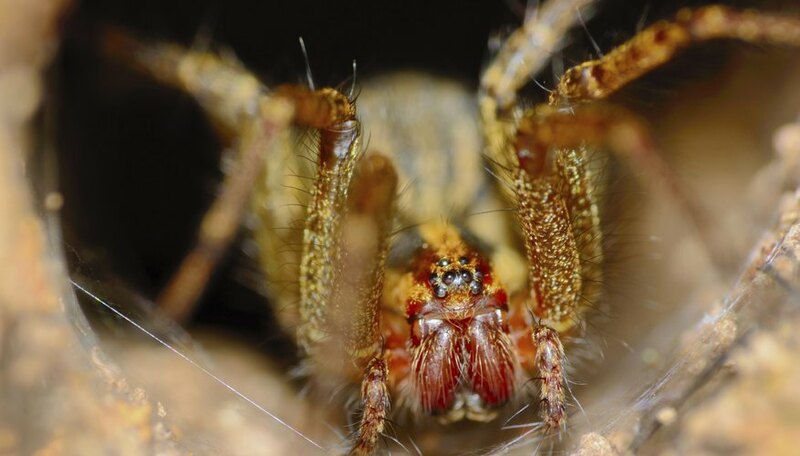 Wolf spiders are solitary, agile hunters, and deliver a painful bite to humans. It's not lethal, however, unless the victim is allergic to the venom. 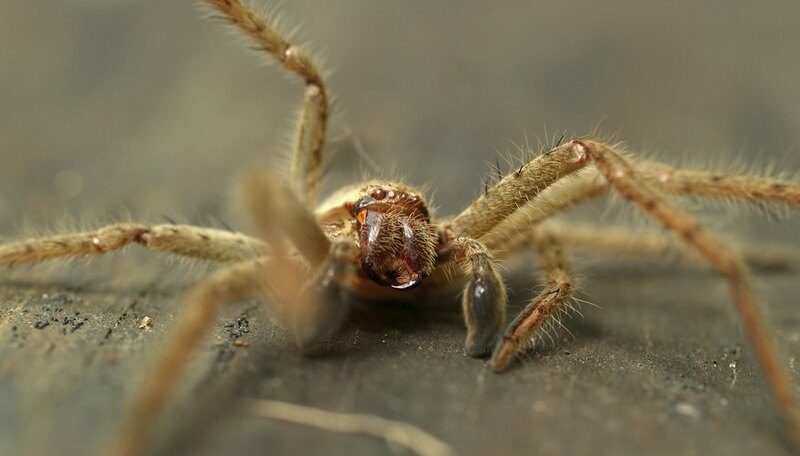 Because they hunt and eat insects, wolf spiders are helpful, natural pest control, especially around the outsides of homes and in agricultural crops. Fishing spiders, from the family Pisauridae, are commonly found in ponds, streams and lakes. They prefer permanent homes in water, rather than ephemeral pools. They are found among emergent plants like water lilies, where their prey resides. 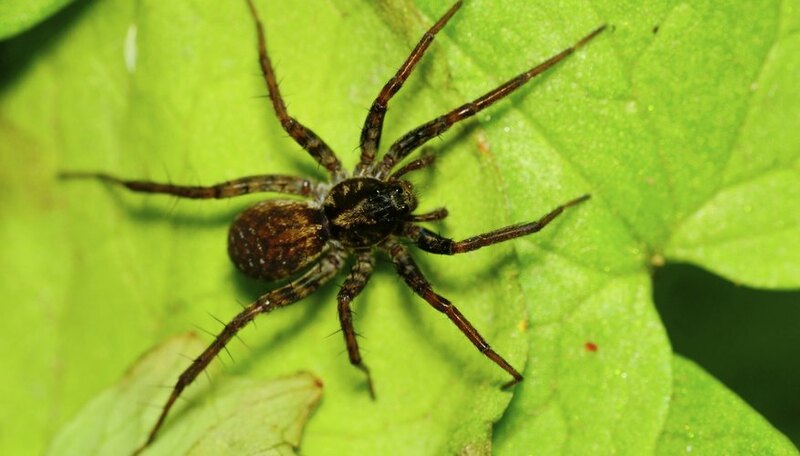 Fishing spiders are among larger Michigan spiders-- some grow to 1 1/2 inches long with dark brown bodies and tan stripes--but are relatively harmless to humans. They hunt for prey on top of, and just below, the water's surface. They even dive beneath, where they prey on small fish and tadpoles. Fishing spiders have excellent vision, and are very sensitive to vibrations. Wood spiders, also called huntsman spiders or giant crab spiders, are a part of the family of crab spiders (Sparassida). They have front legs that angle forward, giving them a crablike appearance. Primarily dull brown or gray, they average between 3/4 and 1 inch, although foreign versions can grow up to 10 inches. They prefer to live in woody places, such as in the crevices of tree bark, or in outdoor wood piles. They deliver a painful bite when disturbed, but are otherwise harmless to humans. The females defend egg sacs and young spiders. Like many spiders, they are beneficial to households and gardens since they control pests, like flies and even cockroaches. The Northern Black Widow in Michigan is a small, glossy, black spider with a very round abdomen. Females average 1 1/2 inches long, including the legs; males are smaller. The underside of the female shows a red marking shaped like an hourglass. Males may have yellow and red spots or stripes on the back. 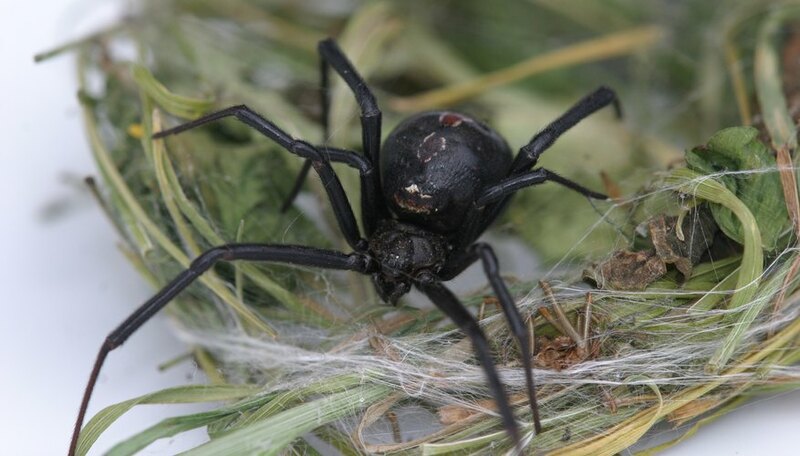 Black widow spiders are most often encountered in relatively undisturbed places, such as brush piles, outdoor toilets, meter boxes, or under eves. They are not aggressive, but do bite, requiring immediate medical attention. Control their population by regularly cleaning areas where they are found. Wearing heavy-duty gloves to do that is advised. 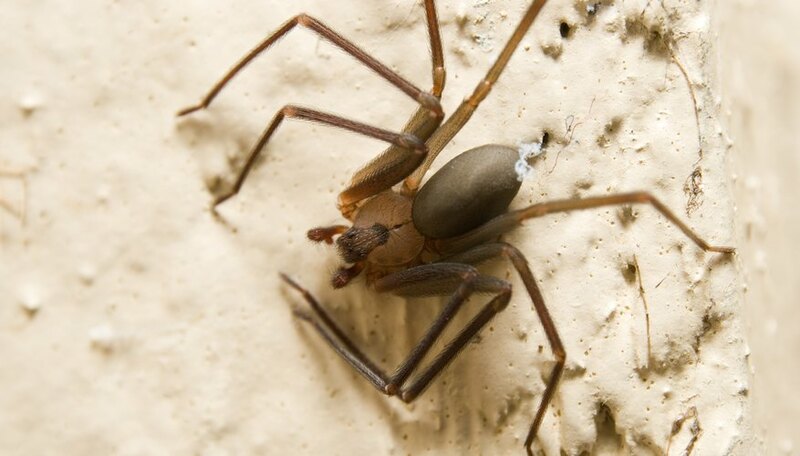 Chances are you won't find a brown recluse in Michigan; the cold winter temperatures--lethal to the brown recluse--prevent it from establishing a presence there. Most alleged sightings go undocumented, so are unsubstantiated. 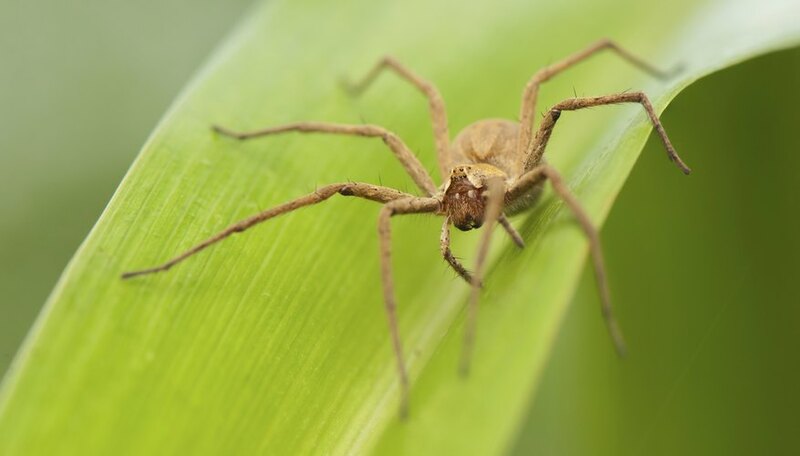 Brown recluses have only been documented in the state once, after being discovered in transported materials from the south. Still, identifying it is important, since they make homes in human dwellings and can be encountered. Brown recluses live in undisturbed places with warm, constant temperatures. They are yellowish-tan and measure about 1/4 to a 1/2-inch long, with three pair of eyes arranged in a crescent shape on the front of the face, and a violin marking behind the eyes. Have any bites treated by a doctor right away. Simone Cole began writing professionally about children, nature and the environment as an environmental educator and communicator in 2008. She holds a teaching degree from Wayne State University and a graduate degree in natural resources management from the University of Michigan. She currently works as an education program coordinator at an environmental non-profit in Detroit, Mich.
Cole, Simone. "Types of Spiders in Michigan's Upper Peninsula." Sciencing, https://sciencing.com/types-spiders-michigans-upper-peninsula-7719991.html. 25 July 2018.